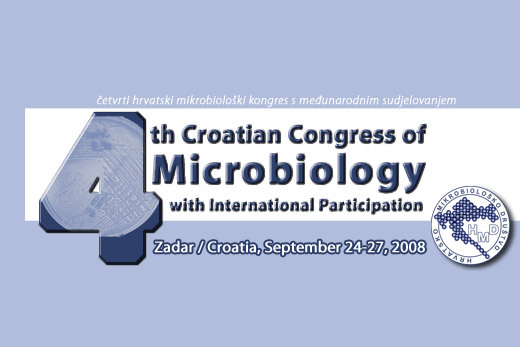 It is with great pleasure and enthusiasm that we invite you to attend Fourth Croatian Congress of Microbiology with International Participation scheduled for September 24-27, 2008 in Zadar, Croatia. The programme committee will design an interesting programme with keynote and section lectures and poster discussion. All important aspects of microbiology will be covered. All our previous congresses were organised at the Adriatic Sea: in Opatija, on Brijuni islands and in Poreč. This time, we will enjoy the natural and cultural beauties of Zadar, Dalmatian second largest city. Zadar is one of the most beautiful and dynamic cities in Dalmatia. It offers an abundant spectrum of cultural and natural highlights and is surrounded with three national parks: Paklenica, Kornati and Krka. During the social part of the Congress we plan to visit at least one of them. Colleagues interested in virology are also invited to participate Federation of European Microbiological Societies (FEMS) supported workshop Adenoviruses – Basic Biology to Gene Therapy that will precede the Congress. The Workshop will also take place in Zadar and its Organizing Committee has secured a FEMS young scientist meeting grant (www.hmd-cms.hr/adenoviruses). We hope you will join us for four days of learning and experience the excitement and the fun at the Congress.